Business Signs Louisville: Why Go With Commonwealth Sign Company? Business Signs Louisville, Commercial Signage, Commonwealth Sign Company, Custom Business Signs, Why Go With Us? When customers drive by your business, what do they see? If the answer is nothing, then you need to seriously rethink your marketing strategy — and, to be more specific, your commercial signage. While e-commerce businesses are more popular than ever these days, there’s still a great need for old-school brick-and-mortar businesses. Your storefront likely serves your community by providing valuable products and/or services to the people who live there, but if they don’t know that your business exists, can’t see your brand name, or just don’t know what you do, then that’s a serious problem. Fortunately, Commonwealth Sign Company in Louisville, Kentucky can help! And much more — installed and serviced by our team! Design – We create a sign design that you like. It’s your business, after all! Manufacturing and fabrication – After design, we physically create your sign. Installation – Your sign won’t magically be placed, but we’ll do the heavy lifting for you. Placement and height advice – Unsure where you want your sign? The experts are here to help. Site Surveys – Let us help plan your sign project on your building site. Permitting – We’re experts in legal matters regarding signage. We’ll make sure that we do it right the first time. Sign Relocation – Need a sign relocated somewhere? Consider us on the job. UL Labeling – We can help provide the marks and labels that your sign needs for certifications, audits, and other purposes. While our designers are happy to create a sign design from scratch if you’re unsure about design direction for your company’s sign, Commonwealth Sign Company also enjoys collaborating with our valued customers. Working alongside your company during the entire process, we’ll ensure that you’re not only happy with how your custom commercial sign looks, but that it accurately reflects your unique business. Need a sign for a temporary amount of time? There are a number of valid reasons why your business should rent or lease a commercial sign as opposed to outright purchasing one beyond financial matters. Learn more about the benefits of leasing a sign and access our leasing application here. With Us, It’s A Win-Win. 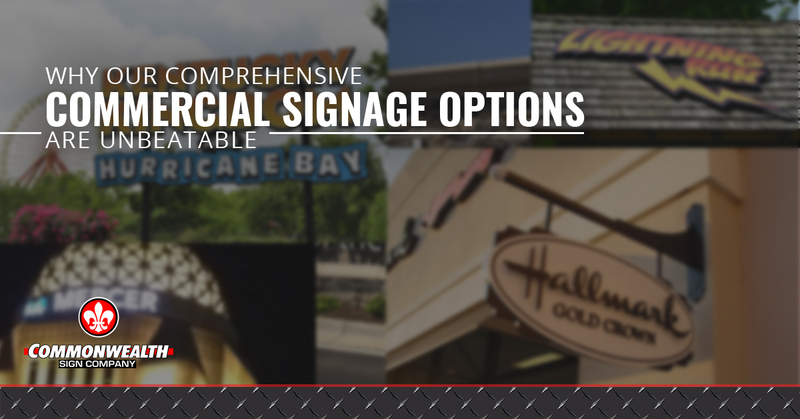 Contact Commonwealth Sign Company today to learn more about how we can help market and increase the visibility of your brick and mortar business!